Todd: So Tres, you are a drummer. Tres: Yes, I am indeed. And for all that negative baggage that comes with that term, yes I am a drummer. Todd: Wait wait, so you say that there’s negative terms that go with being a drummer? Tres: Well sometimes when people hear “oh they’re a musician” you know, “oh you better watch out for them”. Yeah, it’s true. Todd: OK. Well, what kind of drums do you play? Tres: I grew up playing in punk bands, mostly because those were the only bands scouting for drummers at the time. However, what I enjoy playing is funk, jazz, blues and salsa, specifically Cuban salsa. Todd: OK. Now, so for the different types of music that you play, do you always use the drum sticks, or do you sometimes just use your hands? Tres: When I play on a drum set, I either use drum sticks or a bundle of sticks that are really small called hot rods, or brushes. Usually if I’m doing a jazz piece or a very soft acoustic set, I’ll use brushes. If I’m using other percussion instruments, for example a jimbei, then of course I use my hands. Tres: Jimbei is a large drum that comes from West Africa. And you play with your hands using various African poly-rhythms. And lately, a lot of Western drummers have picked up the drum, and have fused Western rhythms along with African and Latin poly-rhythms. So it’s a very fun, but very difficult instrument to play. Todd: What do you prefer, using the sticks, or the hot rods or using your hands. Tres: Again it depends on the music that I’m playing. I enjoy playing in general. My preference would be playing the drum set with the sticks, just because I really love the more rocky-fusion-type-jazz, the more avant guard type stuff. And I also like salsa, which usually, you know you have your clave, which is a little wooden-like block. 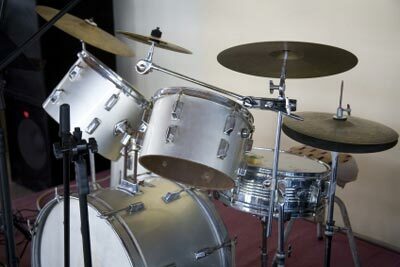 And your calmo, and you also have timbales, which are two drums that you hit on. Sorry for the bad description. Todd: That’s OK. When you’re playing the drums, do you ever lose a drum stick? Tres: I have in the past, yeah. Those question you’re asking are very very embarrassing for a drummer to answer. But yes, sometimes I’ve thrown them into the audience, usually on purpose. But occasionally, a drummer will lose a drum stick. So you usually have a pouch that you’ll put either next to your high hat, which are two symbols that you open and close with your foot, or next to a fore tomb which is the large drum that sits on the ground. So you have extra sticks that you can grab when you need them. And for all that negative baggage that comes with that term, yes I am a drummer. She had so much negative baggage about his profession that she really couldn't believe he was a good person. I have a lot of negative baggage from those years of my life. I grew up playing in punk bands, mostly because those were the only bands scouting for drummers at the time. We are scouting for a new car. He scouted the neighborhood looking for his dog. Usually if I’m doing a jazz piece or a very soft acoustic set, I’ll use brushes. The acoustic version of this song is the best. After the show was over, the band came back and played an acoustic song. A lot of Western drummers have picked up the drum, and have fused Western rhythms along with African and Latin poly-rhythms. The company wanted to fuse the love for peanut butter with the love for ice cream, but the result was terrible. The author fused mystery and romance together perfectly. You have extra sticks that you can grab when you need them. If you want something to drink you can grab a Coke from the refrigerator. Will you grab my jacket from the closet? The band has a Latin-Caribbean sound. A lot of his job is for members of commercial bands. I the first socks I found, and they don't even match. There is a lot of negative that goes with being a lawyer. This radio station plays only music on Sundays.